Sally Barker has been around for decades but her voice just gets better with age. Whether she is singing to seven million on the final of TV's 'The Voice' or to 7 people in a local folk club Sally is the consummate professional. She has the ability to lift the words off the page as if you were hearing them for the first time. Sally began writing songs and performing at the age of 10, influenced by the likes of John Martyn, Janis Ian, Steelye Span, Bonnie Raitt and Pentangle. By her late teens Sally was performing folk and blues in pubs and folk clubs in the Midlands with bass player Chris Watson. Later the duo went on to support Steeleye Span, Gordon Giltrap and Roy Harper. Chris moved to London and Sally entered and won the 1986 Kendal Songsearch Competition with 'Hunting the Buffalo'. Newly solo, Sally got to be the support to acts such as Richard Thompson, Taj Mahal, Richard Digance and Fairport Convention. Solo record deals with Joe Boyd's Hannibal label and the Hamburg based Hypertension Music followed. 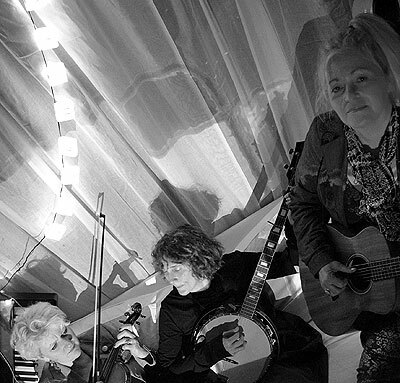 It was around this time that Sally began the all-female folk group 'The Poozies' with Karen Tweed, Patsy Seddon and Mary Macmaster. degree in Music Technology. She took to performing Joni's songs in the duo 'Joni Mitchell Project' with piano and dulcimer player Glenn Hughes. Gradually, Sally began to perform her own songs again and in 2006 rejoined the Poozies. By now teenagers, it was her sons Dillon and Ben who persuaded her to enter 'The Voice UK'. She was Tom Jones' finalist on the BBC TV programme in 2014, reducing Sir Tom, and viewers alike, to tears with her flawless performances. Sally subsequently turned down a large advance and the opportunity to record a covers album for Universal, choosing to finish the Poozies' album 'Into the Well' and work on songs for her new album, 'Ghost Girl' whilst continuing to tour both solo and with the Poozies. January 2016 found Sally on tour in Australia and by March she had left the Poozies again. Solo work, touring with Fotheringay, writing and recording the 'Ghost Girl' album plus writing with highly respected American finger-style guitarist and singer-songwriter Vicki Genfan took up the rest of 2016. Sally has worked with Vicki sporadically since 2002 and their first duo recording 'In the Shadow of a Small Mountain' was released in 2017. Click here to listen. Other duo collaborations include working with Sarah Allen (Barely Works/Flook/Mike Scott) and a new venture with Brooks Williams, with whom Sally toured in May and June 2017. Sally's album 'Ghost Girl' was released to coincide with Fairport Convention's tour as they celebrate their 50 years on the road with Sally as their support artist. 2017 also saw Sally’s friendship with talented musicians and songwriters Marion Fleetwood and Anna Ryder evolve into an exciting new partnership. Individually they are highly skilled performers, admired by many fellow musicians, together, their mix of sublime harmonies, humour, poignant songs and whacky sense of humour converge to form a fabulous new band, IOTA. First performing at Fairport Convention’s Cropredy Festival in 2017, IOTA launched their debut album ‘O Yeh Yeh!’ the following summer before embarking on an exciting series of gigs through 2018-19.